You're never far from The Greatest Snow On Earth® with these solutions. Compatible with iPhone, iPads, and iPod touch. Ski Bus Routes- Quickly find the fastest public transit route for a Utah resort using the new Ski Bus integration. Expand the details and get step-by-step directions. Refine the time results for future schedules. Powder Alert - Pick your powder threshold, time & resorts, and the app will ping you when the snowfall meets your minimums, helping to ensure you don't miss another pow day. Animated Doppler - Track the storm cells moving over-head with resort specific Doppler imagery, check out the current temps and digest the 5-day forecast. Opening / Closing Dates - Using the new "Press To Reveal" function, all resort's anticpated opening and closing dates will display by pressing the resort of your choice on the homepage. Overnight Snowfall & New Snow Since 6am- Ever wonder how much snow has fallen after the morning's 6am report or how much snow fell overnight? Now that powder beta will be available from all participating resorts. Snow Data - 24hr, 48hr, Base, Year-To-Date, Last 7 days of snowfall, NOAA weather forecast, snow propablity, snow stake elevation & mountain peak & base. Evan Thayer Forecasting - Get the latest Wasatch Mountain forecast from the best snow forecaster in Utah, Evan Thayer. Resort Data - Chairlifts Open/Closed, Trails Open/Closed, Terrain Parks Open/Closed, resort events/conditions, high resolution Trail Maps and Live Mountain Web Cameras. 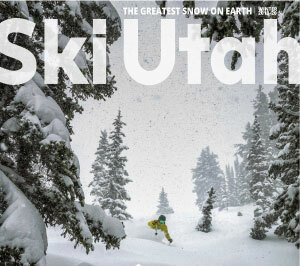 Stories - Check out the latest Ski Utah Stories, great fodder that bus commute or just passing the time while your wax job is drying. Get the snow report via a text message, and you don't even need a Twitter account. Subscribe and you'll receive a text everyday with the latest new snow totals for all 14 Utah resorts. You can display "The Official Utah Snow Report" in your place of business... even if your place of business is your house. All information is updated every 5 minutes, ensuring the most accurate details. Each user can select/limit the Utah resorts displayed. New Snow Since 6am Ever wonder how much snow has fallen after the morning's 6am report on a big storm day? Now that powder beta will be available from all participating resorts. Road Restrictions - The latest road restrictions, for each resort's main access road(s), updated every 5 minutes. Weather - current temps & an accurate 5-day weather forecast. Snow Data - 24hr, 48hr, Base, Year-To-Date and the Last 3 snowfalls. Any display that has a web browser access, like a TV, monitor or projector can display the application. All you need is a way to connect the display unit to the web browser. We've found the best combination to be a TV or Projector with a Chromebit attached and connected to your WiFi, running Chrome as your web browser. Display the latest Utah resorts snow totals on your website with the new snow report widget. To add the widget to your website, just copy and paste the provided code to an open area like a sidebar, footer or to the main body of a page and the widget does the magic. Snow totals are pushed to the widget every 5 minutes, so you can be sure they are accurate. The Ski Utah Snow Report Widget is a free module available only to active Ski Utah members. The all New Ski Utah Skiosk - a tablet based snow reporting app that allows you to incorporate your business. Member's can choose any tablet friendly web address & assign a logo, and it will live in the lower navigation of the skiosk. Originally developed as an opportunity for lead generation through contests or sign-ups, uses are endless. Some creative ideas, are to utilize the space for an online conceriege service in rental properties or for completing a ski/snowboard rental reservation. Skiosk users are locked into the snow report app & the one assigned URL, they can not freely browse the internet. Resort Data - Chairlifts Open, Trails Open & Terrain Parks Open. Hardware is not included with membership, Skiosk requires an Android or Apple tablet (Kiosk enclosures & stands sold can be purchased through - Armoractive.com). Want access to just the raw snow report data? Have access to a web programmer, or are one yourself? PERFECT! unique resort id, resort name, base snow (inches), new 24hr (inches) , 48hr (inches), resort comments/conditions (updated by resorts, usually regarding an event or terrain announcement), resort elevation base, resort elevation snow stake (the elevation of the snow study plot for snow reporting), resort elevation summit, resort logo as an SVG, resort web site url, and a time stamp for when that resort's report was last updated. Credit given to Ski Utah by including "Snow Report Brought To You Buy ". The Ski Utah Logo links back to http://www.skiutah.com/snowreport - "Credit" should be listed directly above the container displaying the snow report details. If you've ever driven by the Ski Utah Headquarters before the sun is up, and noticed the LED sign, you may have also noted the Fat Flake changes colors. The flake changes colors based on a couple of snow indications. WHITE - The building has electricity!